NEW DELHI--(BUSINESS WIRE)--Sep. 26, 2017-- India’s minister of petroleum and natural gas and skill development and entrepreneurship, H.E. Shri Dharmendra Pradhan, the secretary general of OPEC, H.E. Mohammad Sanusi Barkindo and the president and CEO of Saudi Aramco, Amin H. Nasser will be among the featured speakers at India Energy Forum by CERAWeek, October 8-10 at the Taj Diplomatic Enclave in New Delhi. Global business information provider IHS Markit (Nasdaq: INFO) will host the forum. 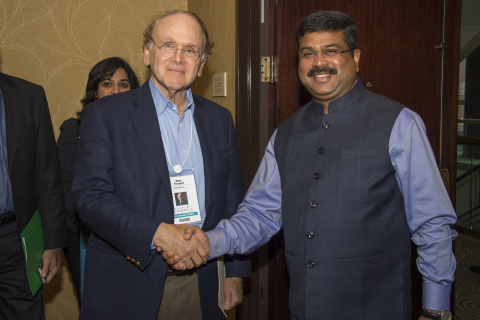 “India’s oil and gas industry is at a pivotal moment of transition and resurgence,” said Daniel Yergin, IHS Markit vice chairman and Pulitzer Prize-winning author. “IHS Markit is pleased to host the inaugural India Energy Forum by CERAWeek under the patronage of Minister Pradhan and the Indian Ministry of Petroleum and Natural Gas. “Participants will find a rich experience, both in the conference program and in interactions with fellow participants,” Yergin said. India Energy Forum by CERAWeek will convene an international group of speakers and delegates as well as a community of more than 500 delegates from Indian and regional energy companies, institutions and governments. How will technology transform the oil and gas industry? What is the realistic future for the electric car? Visit www.ceraweek.com/india for a complete list of speakers and the most up-to-date program information. Session times, topics and speakers are subject to change.